4 - 3..........Guys Hilo vom Norden Stamm. Damien vom Steinbachtal competed two times in the D.V. Meisterschaft and passed the Körung 'for life' with highest rating for working drives. He lived to 7 years of age. 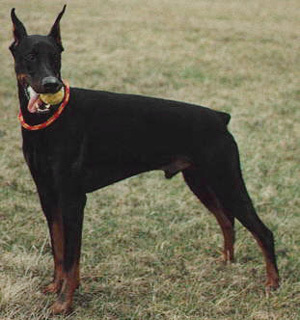 Damien's litter-brother, Dexter vom Steinbachtal, was the winner of the D.V. Meisterschaft in 1992 with 289 points. Their sire, Leander von Nymphenburg, passed the Körung with Körklasse 2A rating and their maternal grand-sire, Ali von Langenhorst, passed the Körung 'for life' with highest rating for hardness and working drives plus winner of numerous show titles. Aaron: SchH 3, FH, DV-DM participant and passed the Körung 'for life' with Körklasse 2A rating and highest rating for working drives. He is the sire of the vom Ferrenberg “A, B, E” litters (Balou, Escara); von Warringhof “P, Q, S” litters (Phil, Pilar, Quando, Sheba) and vom Aurachgrund “E” litter (Eick, Elfi). Werra: SchH 1and passed the ZTP with 1A rating for character and V for conformation. She is dam of the vom Binselberg “B, D, F, G, H” litters (Faruk, Hiska, Hydra).